Think of a more or less traditional medieval fantasy world: multiple races, magic, some alchemy/magitech that is of comparable power and reliability to ordinary magic. And in this world there exists the Loveland, where all the people are pacifists and do not accept violence towards other people for any reason (the question as to what constitutes "people" is outside the scope of this question, but they are fine with slaughtering cattle that they grew). Now, how could such people protect themselves and their land/property from being raided and taken into slavery by the next band of orcs passing through? There is no Unobtainium in their possession that they can deny rest of the world if attacked. The country survived for centuries, so this should be a reliable method not easily countered, not some sort of one-shot lovecraft surprise. The technology/magic in their possesion is not significantly superiour to that of their neighbours, so any wall/barrier can be breached given sufficient time/resources. The land is rich and bountiful, so others would take it if they could. Amongst races of the world there are sentient undead, golems and elementals, immune to mental magic (and yes, they are considered "people" too for the sake of "no violence" rule). The most obvious choice would be to enlist protection of some sort of allies, but who will protect Loveland from those allies when they change their mind/ruler? Any sort of mind control can be noticed over sufficiently long time and will only foster enmity between allies. And this sort of violence by proxy has quite a limited distinction from ordinary warfare. So, with the aforementioned assumptions, how could a pacifist country reliably protect itself from any threat, including betrayal by an ally? What about the case with an additional limitation of no violence by proxy allowed either? A raid is only in part about finding a target that is weak enough that you can take what you want. The other part is about the idea that there is something to gain there, that is worth more than the cost of going in and getting it. Even if it's possible for other races to bring down walls that these creatures create, that doesn't mean it's cheap. If it takes month to bring down a wall, only to realize that a new one has been crafted behind it, at some point raiders will realize that they are wasting their time. Physical intervention. Walls, mountains, ravines, raging rivers. All the things that make it really difficult to bring an army and really slow to progress. Misdirection. Either magically or not. After three weeks of marching for the pacifist city, the enemy ends up... back home. Supply disruption. Realizing after a week of besieging a city that all the incoming caravans consist only of carters complaining that all their food keeps getting stolen. Without food, sieges will have to be aborted. Breaking morale. Disgruntled troops require a lot of resources to keep them from killing each other or deserting your forces. Targeted, hard sound at night to keep them from sleeping. Unleashing vermin on the camp. Spoiling the enemy's food. Breaking whatever entertainment gear they have brought. Eventually, people will go crazy. If you keep it up, at some point, the enemy will simply not want to keep wasting time and money on trying to get at you. It won't be worth it, no matter how much gold is promised, to be so miserable for so long, with nothing to show for it. It's right there in the name: There's no need to fear invasion or retaliate with violence against any foolish enough to violate their sovereignty, because the inhabitants have weaponized love! Any self-respecting medieval fantasy kingdom is going to have forests all over. Well, these woods are filled with nymphs. Normally they're sweet, peaceful creatures dedicated to strengthening the forests and keeping the ecosystem healthy and in balance, but you do not want to threaten them or their home. They'll wander in to enemy camps and use their natural beauty, magic, and feminine wiles to seduce the troops, and especially the leaders, into a highly suggestible state that its victims call "true love" and many outside observers would call "mind control." No one truly knows what happens to those who succumb, but common reactions from soldiers who survive and manage to escape from Loveland include PTSD symptoms, a tendency to flinch when touched, despondency, heartbreak, alcoholism, and swearing off women forever. Remember the three means by which civilizations live or die: "Guns, Germs and Steel". Since you say the Lovelanders have given up weapons (no guns) and have no superior technology (no steel), I direct your attention to germs. The people of Loveland have developed an immunity or tolerance to some parasite or disease that is localized and endemic in their land. This disease is debilitating to most outsiders, possibly even fatal. Exactly how the Lovelanders developed this immunity but other people could not has to be hand-waved; you might make a concentrated exposure to this thing a rite of passage for native Lovelanders as well as any outsiders wishing to join (and not all of the native-borns survive it). Since most outsiders couldn't withstand even casual exposure, the Lovelanders are really under a de facto quarantine; they're perfectly happy to stay in their own lands, and nobody else ever goes there. ...Until your hero discovers he's not only immune but not even a carrier for the bug, which is very rare (bordering on a religious phenomenon), allowing him to come and go as he pleases, furthering the plot. In real life (RLtm), this situation exists with various nonviolent religious sects seeking haven inside the United States. Like in RL, it would work over long periods of time if Loveland were embedded within another country that tolerated or encouraged its existence and was powerful enough to defend both. I know that this slightly violates your "no violence by proxy" statement. However, consider that the surrounding country would use violence only to defend itself. That vigorous defense would not be on behalf of Loveland. However, it would have the effect of protecting Loveland anyway. Loveland provides an essential service to its neighbors, the continuation of which is considered vital to the stability of the world around it. One such service that comes to mind is banking-- maybe something along the lines of the Iron Bank in Game of Thrones. Loveland has proven to be an honest, reliable and impartial manager of the region's cash flow, and it is widely believed that anything more than a minor disruption to its daily operations could introduce a catastrophic amount of uncertainty into the neighboring economies. Other countries may contemplate a hostile takeover as a means of debt relief (for, nearly everyone has borrowed vast sums to fund their various conquests), but they aren't about to let any of their rivals get out of paying off their debts-- much less start collecting payments from everyone else. Thus, any attempt to invade would have the same result as described in scenario 1. Loveland has focused solely on defense while the other nations have focused on developing strong offensive capabilities, or a balance of offense and defense. So, while the Lovelandians may not have catapults or fireball spells, their castle walls and magic force fields are always just good enough to shield them from the outside world. This may seem to contradict the OP's third bullet point, but I don't think it does. True, any wall can be breached if you put enough time and effort into it, but if you breach a Lovelandian wall, you'll probably just find another, even stronger wall behind it. They can keep bolstering their defenses for as long as you can keep trying to break them. Loveland has, in fact, been invaded, but the invaders were so bewitched by the beauty and enlightenment of its culture that in the end it took over them. Instead of defeating or destroying the Lovelandians, they became them. (The saying "Rome conquered Greece, but Greece conquered Rome" comes to mind). Loveland has nothing to offer that is of interest to anyone outside of Loveland. (I just realized that this does, in fact, contradict the bullet points in the OP, but I like it too much to remove it). Maybe it's a barren desert, smelly swamp, or other wretched environment that no one but a Lovelandian would even want to visit, much less own. The weather is unbearable, the scenery very unscenic, and the resources, if there are any, are worthless outside the country (maybe they crumble to dust due to some ancient curse or something). The Lovelandians adapted to this place long ago, but no one else has, or wants to. Their land and they themselves are considered holy by the other peoples. So offending them is a sin that will bring your soul to the hell after death or damage your karma. Or they believe gods will revenge for them (see Iliad). Consider how religious societies, monasteries and theocracies survived on Earth. Alternatively they do science so that powerful neighbours respect and protect them because they bring insight into how the universe is functioning or provide astrology/oracle services. They're surrounded by two countries who have treaties defining what their borders are, and other countries in the area who will intercede if one side violates the treaty. Then, make it so that there were several agreements between the two countries about what the borders were, with slightly different dividing lines. The agreements differ in two regions: Loveland and Moneyland. Each treaty gives one region to the first country and the other region to the second. Since neither region wants to give up Moneyland, they can't claim a legal right to Loveland without angering their neighbors, and provoking hostilities. Make Loveland be basically a city-state that existed before the conflict started, and both sides would likely leave it alone, while also being willing to step in and defend against other nations. Note that this doesn't conflict with the requirement that "the land is rich and bountiful." It can be as prosperous as you want, just as long as the other region is even more valuable. This sounds like a ridiculous and completely unsustainable situation, but there's an example of something very similar in the real world. Bir Tawil is 800 square miles (2060 square kilometers) of unclaimed land between Egypt and Sudan, because neither wants to relinquish a claim on the Hala'ib Triangle. And the dispute has lasted over 100 years, proving that such a situation can last for extended periods of time. Here's my suggestion: They are neutral, the banking country. All other countries trust Loveland, and store their money there. If a country then attacks Loveland, they lose their money. The aggressor then gets attacked by the other countries, who are defending their own interests. In order to prevent small raiding parties, the other countries send a detachment of soldiers to patrol the borders, and to hold the line against a full attack until reinforcements arrive. If needed, the backstory can have a country which attacked Loveland, and got promptly destroyed. This protects them from betrayal, but it might violate the "No violence by proxy" restriction. There are actually a few countries in the modern world with no military. They do seem to all share a few things in common. They are all tiny in territorial (and probably population) terms. The only one I don't have to squint to see on a world map is Iceland. They have relatively inaccessible territory. 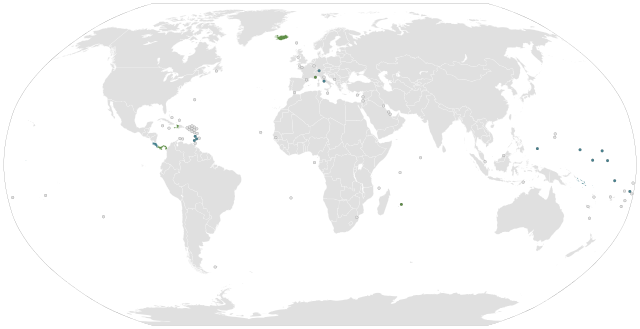 Almost all are islands. Of the ones that aren't, two are almost entirely jungle, and two more are tiny mountain countries. The sole exception here is Vatican City. They are under the protection of larger neighbors or benefactors. You could claim Vatican City to be an exception here too, but you can't really get at it without sending your military through Italian territory (their capital, no less). Italy is of course a NATO ally, with their own military and under the protection of the US. So it looks like realistically a putative pacifist nation will be a relatively small country, perhaps too small to stand up to any serious attack anyway. It will be an island nation, or in some other kind of very difficult to maneuver terrain. And it will be somewhere a much larger nation that does have a good military considers within its sphere of influence. The combination of the difficultly in conquering them and the possible response from their allies makes them not worth the effort of invading. The country is spread out through a jungle, filled with giant hungry raptors that don't mind the locals, but will eat anyone else that intrudes. The country is an island surrounded by kraken infested waters. The country has only one point of entry (surrounded by a mountain range), and the locals can lower a barrier or drain a lake preventing passage. The barrier cannot be passed because for example, the bottom of the lake is made of quicksand or full of monsters. The country is permanently -100 degrees, the locals have adapted via their subspecies, magics, technology etc. so any army marching on it would die from exposure. The country is very, very far away from everyone else such that no army could carry enough provisions to reach it (but a boat filled with provisions could sail there with a small crew). The land is poisoned and kills all living things on it unless they consume some plants to get immunity that are only found on the land and prepared in a certain way. Outsiders will perish upon entering the country unless they drink some of the potion. If the get invaded, they totally do not cooperate with the invader. They ignore them, do not cooperate, loudly declare the injustice, and are utterly unfazed by threats of, and acts of, violence against themselves and their families. Naturally, quite a few do get killed/tortured right off the bat, as the invader tries to impose their will. But what the heck do you do with a population that's immune to being intimidated, and is completely harmless against you even as you're hurting them? There's nothing you can do. Invasions require that the target population is, at some point, going to obey you to stop you from killing them. So, unless the invader is purely genocidal, the invasion will fail if all the pacifists stick to their principles and don't back down. For real life examples, look at Gandhi, Martin Luther King, Denmark's response to Nazi invasion, and the Addio Pizzo against the italian mafia. There was an old sci-fi short story like this. I can't remember what it was called, but aside from being pacifist, the native population also didn't have currency, or a desire for it. Their economy ran off of obligation, and whenever an invader tried to make them do something, they'd say "I don't ob you". Note: to those thinking I typo'd "I don't ob you" and it's supposed to be "obey", don't edit it, it is "ob". Ob stands for obligation, which was essentially how they managed their economy -- by mentally keeping track of who owed what to whom. The invaders, being new, were owed no obligation by anyone, and being obnoxious, no one was willing let them get obligated to themselves. The weapon of Loveland could just be their way of life (or ideology). They are pacifists and making their magic be the fact that proximity of others to them makes those invaders gradually become pacifists too will be a way to defend them. To make things more dynamic you can vary the strength/effectiveness of this magic on variable factors like population. For example, an army of invaders attack Loveland and as time passes a percentage of them keep defecting to become pacifists too. If an invader comes with insufficient numbers, they will end up all becoming pacifists before they take Loveland. If an invading army plans a drawn out war it will have to keep replenishing or it might lose its force to the pacifist ideology. This also means Loveland can defend its territory like others do, but since they do not have the usual violent attack feature, they have this special ability. Loveland can still be defeated with overwhelming force and and speed. Which, just happens to work in most invasions anyway. Loveland has specialized in healing magic. They supply the best healers in the world. If a foreign country attacks them, their healers leave that country and go work for nicer employers. Loveland could be under the sea. Since most races are primarly living on land it would be a impossible to conquer. The ocean has a massive amount of resources and trade with harbortowns could be possible. They could sell the same resources as those landliving races plus corals. Loveland could also be a flying island filled with harpies. They could have resources lighter than air to gain their wealth. I can think of two scenarios. One is to be more economically worthwhile at peace than plundered by war, not because of having a monopoly resource but because the work output of the people is valuable. Another is providing a threat of massive destruction, even if they're not prepared to carry it out. Before getting to this, let me provide a bit of background about LoveLand. LoveLand has actually had a blemished past. It used to be a closed country, with no-one allowed to enter or leave, on the penalty of life imprisonment without parole (remember, no violence). However, one day black ships entered its shores and forced foreigners to be allowed to land and trade with them. Meanwhile, several countries in the region had been occupied by raiders from far away. LoveLand decided that it should do the same as well. These conflicts became increasingly violent and against more and more countries. It ended badly for LoveLand. Along with large losses on the battlefield, dozens of cities were devastated by bombs designed to burn them to the ground, and near the end two of its cities were flattened by a single Phlebotinum bomb each. The victorious parties occupied LoveLand. Ministers who served LoveLand were executed by the occupiers, and LoveLand had imposed on it a constitution forbidding it from going to war again. However, the royal family of LoveLand were left unharmed, perhaps to make the occupation easier. The occupiers had no deep enmity for LoveLand, and soon drew their attention to other wars and conflicts. While LoveLand is not a barren wasteland, it is not abundant in natural resources. It imports food and mineral resources from other countries, and sells manufactured goods. It has become reasonably prosperous since its last war. One of LoveLand's most powerful neighbours is the Middle Kingdom. It has been invaded multiple times by LoveLand in the past, and anger between the two countries still exist. While LoveLand does not have any Unobtainium in particular, trade between the two countries is very vigorous. If the Middle Kingdom were to invade LoveLand, not only would trade stop during the invasion, but LoveLand's ability to create manufactured goods would be harmed for a prolonged period of time. LoveLand is more valuable to the Middle Kingdom as it is with its people contributing to the international economy than as an plundered shell. They may not like each other, but they need each other. LoveLand is pacifist, but its neighbours don't know that. It has a reasonably powerful military. Also, while LoveLand's government says it doesn't have any Phlebotinum weapons, and vigorously calls for world-wide disarmament of them, it currently uses Phlebotinum for generating electricity. What if it is lying and secretly has Phlebotinum weapons? The only way to find out for sure is to invade LoveLand, and the potential consequences are too catastrophic to bear. Both economic factors, and a deceptive threat of force, would work best if LoveLand's neighbours were large, stable, rational countries that have a lot to lose from war. It would not work well in an anarchic world with lots of small factions that are likely to act recklessly and irrationally. In real life, LoveLand (Japan) is also protected by the United States and other allies, but that goes against the requirements of this question, as that probably consists of violence by proxy. I swear I've seen this scenario a few times in cartoons etc., and can name several instances in nature where animals do this. The country would need outposts or a way of knowing the enemy were coming. They'd then need an elaborate plan to scare the enemy away. This is actually done by North Korea at the moment by broadcasting footage of their apparent military might. All they need to do is make the enemy think they're marching to instant death. A handful of ways to do this: walls made from skulls, huge displays of magic, breaking a dam or detonating an explosion to cause a huge natural disaster, not aimed at killing anyone but creating a loud sound or "sign from the gods". One solution would be using nonlethal defense. Real life example is pacifistic caring pepper spray (rather then knife or gun). Make spell or magitech that incapacitated attacker without harming him. Another would be demotivating attacker form attacking at first place. Cast curse spell on property, that would bring misfortune on whoever steals it, deterring raiders. If they don't have any technology or magic superior to the other so why others would attack them? In my opinion pacifist country should be nomads, so if anyone attack them, they just leave and left the empty space behind. the complete refusal to provide their services to the offending party any longer, eventually causing them to be conquered by the neighbouring countries. Your medieval nation will need to weave a deep network of alliances and royal marriages. If you marry your royal house into the houses of several major nobles from the regional superpower, or better yet, marry into the regional superpowers family. I am not sure how marriages work in your world, but I have to assume it is something like our world where either it is a one-man, one-woman marriage or a one-man, multiple women marriage unless specified otherwise. Since in the Middle Ages things worked more as a "by family" basis rather than a "by kingdom" basis this obliges the nobles you married into to defend their relative and her/his new land and titles. By weaving a complicated series of alliances and marrying into major noble families all over the map. They still have a shot. Diplomacy is still the only way to go. If your peaceful Loveland swears fealty (basically agrees to pay a tribute) to warlike nation B then nation B now has an obligation to protect Loveland. If for some stupid reason nation B feels the need to turn against Loveland, then Loveland can call other nations into the war via offering highly reduced or even no taxes imposed on merchants from allied nations and nobles. You specified no unobtanium, but also stated it was a rich land. This leaves two possibilities: Either Loveland lies on a very important trade route, or its craftsmen are unusually skilled. Either way they have a lot to offer any allies. If they have skills such as master carpenters or masons (both valuable skills of the time for castle construction) they offer state funded craftsmen to build their allies fortifications and towns. Rather than fighting a real war, Loveland can incite fighting between the major powers and thereby keep them too occupied to care about little Loveland, although this might not fit within your "no war by proxy" rule. A good spy network will allow Loveland to place bribes, insults, and other tools in such a way to incite small scale wars between potential enemies. This keeps them too busy fighting each-other to worry about a small, pacifist nation on their border who has never done them any harm. This route is risky, however since being discovered by either side will lead to a declaration of war. Then Loveland will fall back on the multiple alliances it should have. Ever heard the saying, "don't put all your eggs in one basket"? If Loveland is very unlucky and all of its allies turn against it (how the hell does that happen!? If Loveland had been listening to me up until this point that cannot conceivably happen!) it is screwed anyway. Very few nations could survive every other nation in the region ganging up on it, even if it wasn't pacifist. You specified orcs specifically. The allies could be coerced into sending a standing group of knights to defend Loveland, or there could even be knightly orders established to specifically defend Loveland, or generally, anyone from marauders/wild orc bands. IMO there is no way a nation can remain independent for very long without any form of violence. It could scrape by for a century or two but it would definitely not survive longer than that unless it was a religious state (see the Vatican). No protection over the belongings themselves: keep them safe by running with them, putting barriers around them, or other keep-out-of-reach methods which can be defeated but are annoying to do so. Just give in to whatever people want - will only come to harm if harm is their goal. In the story Forget It by James Schmitz, there was an alien life form that protected itself by causing those who intended to attack it to forget. It started by having them forget a couple minutes. If they still intended to attack, it had them forget progressively more: hour, day, week, month, year, decade, etc. Some of the people in the story reverted to babyhood (mentally). It was a temporary effect but lasted long enough. Schmitz used psionics to provide the effect. In a magic universe, it could be provided by magic or deity. It's essentially a magical effect anyway. This is a non-lethal, temporary effect. So consistent with pacifism. Even if other countries can cast the same spell, it doesn't work offensively. Their own soldiers are as affected as the enemy. Not a problem for a pacifist who doesn't intend to attack anyway. This makes this a pure defensive weapon. Note that this actually reinforces the pacifism. Someone who frequently thinks aggressive thoughts will be constantly forgetting. This will be frustrating to those who are not pacifists. They will likely leave voluntarily. You mention undead, golems, and elementals as being immune to mental magic. They wouldn't be subject to forgetting. So surround Loveland with an anti-magic strip. "What do Lovelanders call golems?" Punchline: "Statues!" Magical attackers get stopped at the edge. Because the effect is geographic, it's useless for attackers. Again, it's purely a defense. One could argue that this effect is not consistent with pacifism. So don't make the pacifists responsible for it. Someone else did it for them (possibly a deity). They just reap the benefits. An army of humans and undead attacks. The undead are dispelled by the anti-magic strip. The humans forget until they no longer have aggressive thoughts. The Lovelanders guide the attackers back out of their area. If memories are both removed and restored magically, the anti-magic strip will prevent the effect from wearing off. So people in the strip will be stuck with no memories. If they continue on outside, they will recover. Even the combination is not completely invulnerable to attack. But it is not unreasonable to think that they might get away with it for hundreds of years. The vulnerabilities are non-trivial to exploit. Further, even a successful attack leaves the attackers stuck in a land inimical to aggressive personalities. And they can't steal any of the magic items from inside. The anti-magic strip turns them into junk on the way out. Golems! Have a large defensive army of golems. They can defend non-violently. Consider a 5 year old attacking an adult: the 5 year old can kick and scream and bite etc., but the adult can easily restrain the 5 year old without harming them. A human/orc/etc. attacking a Golem would be a comparable fight - you might get a few scratches on the golem (not a problem), but the golem can easily restrain the human/orc/etc. While we tend to use violence as a category, suggesting something is either violent or not, I have found that, when you press someone to actually define what they will and will not do, violence does not have a hard crisp edge between violent and non-violent. I have found that, when you start to dig at it, violence is more of a scale, from "purely pacifist" to "utterly violent" with everything between. As such, you might find your country more realistic if it approaches the concept of "pacifist" more fluidly. The definition I find very effective for defining violence in a way which is in line with all sorts of things we call violence (physical violence, verbal violence, etc.) is to consider the violence of an act to be how much you force the world around you to bend to your will, versus how much you seek to find a way to work with the world to accomplish a common goal. These two concepts work together quite well, because it enables a pacifist country to simply guide a warring country into a position where its violence is redirected towards itself. It's simply a matter of allowing the warring country to get their near term goals every time, while making sure the way they get those goals supports your goals (which may involve drawing the other country's own blade against their throat). Of course the devil's in the details. Nobody has written a document describing a universally successful way to do this. Everything has to be situation dependent (otherwise you are imposing your will over the world, rather than working with it, and you become violent by accident). Nations have conflict because this is so mindnumbingly difficult to do. There are a few examples, of course. Switzerland is famously neutral, bordering pacifist. Of course, if you dig into their history, you can see that they aren't just sitting back and waiting for the violence to come to them. They simply make sure their activities remain below the radar. Although a pacifist country sounds like one with high moral standards, I saw no prohibition against deception. Any time a would-be invader reaches the borders, Loveland can put on a show like they were just invaded by a massively superior army. Scouts would report on the identity of the invaders (their race, at least), and the leaders would set up a ruse in which half the population posed as fighters from the least desirable army for the invaders to fight, and the other half posed as their newly acquired slaves. As long as it's ok to pretend to have committed violence, this should not violate the Lovelandian pacifist constitution. Of course, the Lovelandians would have to be excellent actors, and may even have to simulate violence against each other to make the ruse of slavery believable. But you don't need mind control magic if you have sufficiently convincing illusion magic, combined with actual theatrics (elaborate set-building, pyrotechnics, melodramatic acting, etc.). The key is that there has to be a set of credible opposing forces at all times. If one country becomes an absolute superpower (even all other countries allied against it would fall), then this ruse wouldn't work. As long as there is possible balance amongst the viable set of invaders, each one can be led to believe that others have beaten them to the punch, and that retaking Loveland would cost too much. Obviously, the Lovelandians would choose an opponent that has access to weak areas of the invaders, to complicate the strategic calculus. Also, the Lovelandians would have to have intricate knowledge of their neighbors and the political situation in the surrounding countries. If their land is rich and bountiful, they should have the resources to run an extensive spy network, and curry favors with various nations to pump them for information. And the speed of information must be limited. If invaders can instantly check the status of their neighbors, then this scheme obviously won't work. If invaders have deep lines of communication with their enemies, then the scheme will get exposed sooner or later. Even if the plot is exposed, the Lovelandians can simply invent a foreign invader, and be "subdued" by them. The trick is putting on a credible show of strength for such an invader. Again, illusion magic is the best bet here, as well as physical isolation. If it is difficult and expensive to get to Loveland, then they merely need to demonstrate that an invader has marshalled a very large force to occupy the country. The very presence of such a force would be evidence of its power. And isolation would help with information flow and reduce the probability of invaders attacking in the first place. Again, deception is helpful. The best bet for true pacifists is to simply hide. If Loveland lay within a rich forested area, then they only need to turn the forest into a kind of labyrinth, where explorers are led down winding paths that circle back out of the forest. The forest closest to the country proper should be made to look decrepit and haunted. Having some undead allies and wandering golems make it look like nothing but ghosts remain would help deter raiders from looking for Loveland in the first place, let alone stumbling upon it. A long time ago, a deity -perhaps offended by the acts of some humans- determined that there was too much evil in this world/continent. So it set up a spell that intended to counter it. Now, there's good and bad inside of everyone, so it simply takes the average evilness of the continent population and, if it passes a threshold (nobody actually knows its level or how evil current society is), automatically kills the worse offenders. Many royal families disappeared as a result of their members being precisely those offenders when this was implemented. The country rulers reacted to this spell by founding Loveland in the middle of the continent, so they can continue with their abuses confident that the peaceful nature of LoveLand will counteract their own acts. Peaceful people move to Loveland in a similar way of how people retreat to a monastery, for praying for the world. And as long as not many people do that (how many people want to leave their home and travel into a remote country they barely know about? ), the rulers will be happy with it. Anyone that attacked LoveLand would destroy this equilibrium. The head of the army is the most likely to die the first, as shows that he was so greedy that he even attacked LoveLand (and the second-on-rule would quickly retreat in order not to be next), but the surrounding countries would also fight against those putting LoveLand at risk, since that would also, if they are tyrannical, put in risk their own live style. And if they are not, would not like those Huns around, either. Do remember that even if their are quite nice rulers, nobody knows exactly what's the margin until the spell activates, or how many Lovelanders can be safely slaughtered. Even if they aren't killed or enslaved, just the anger for the intrusion would decrease their loveliness, and increase the risk beared by everyone. Not everyone in Loveland is born loving pacifism and peace and all that stuff. So, what happens to the ones who don't fit in? Well, they quietly leave. What Loveland has defending itself is a sort of miasma of people who are just too sociopathic, too dangerous, too damn good at killing to live in a pacifist society, who willingly walk out into the wilderness, cut their ties to their mother country, and then spend the rest of their lives fanatically defending their birthplace. For this reason, Loveland has what can be considered the largest, most expansive intelligence/assassination network and the most powerful legion of irregular troops, militias and adventurers operating beyond its borders. These are deeply, deeply scary people. Your orc raiding parties? They never even get close. Tyrants trying to raise an army against them? They die mysteriously in their sleep. Any atrocity done against Loveland is returned sevenfold. Of course Loveland would vehemently denounce the horrible actions that are done for them. Indeed, all of these people count as at best exiles, at worst outright in rebellion. But hey, what do you expect Loveland to do about it? Fight these people? Cover the pacifist settlement with thick forests and fill these forests with jaguars and venomous snakes which are mind-controlled by the pacifists (magic) to not harm them but growl and hiss loudly upon seeing any other person from far and charge at them if they approach closer. With medieval technology, it would be impossible to fight these mind-controlled beasts in a thick forest. A superset of Youstay Igo's is to place Loveland in a location with natural barriers of some sort. Those natural barriers might make Loveland's existence unknown outside its borders or might make getting any sort of armed force into Loveland an impossibility. Natural barriers could take the form of liquid, mountains, life (think forests, wildlife, etc. ), deserts, etc. For story purposes, it is probably better that Loveland remain unknown rather than known but unable to reach. My reasoning is that any sufficiently motivated, power hungry human would eventually figure out a method of crossing such a barrier to pick the "ripe plum" of a country of Loveland. Also consider that non-violent does not mean stupid. If conquerors arrive in small numbers, the Loveland police or militia "forces" might simply take them into custody (non-violently) and apply non-violent punishments ("you must perform 2000 hours of community service") or incarcerate them to prevent them from committing violence upon Loveland citizens. They can be unreachable. Loveland is surrounded by a "cursed" forest where any foe will lose their way and find themselves unable to get through. Or the whole nation is on top of a plateau so high it's impossible to climb. Of course they have exclusive access to the way in and out of forest or the plateau (flying apparatus, dragon riding, magic passage, teleportation, etc). They can hide. Loveland is invisible, nobody knows where it is and its location has become the goal of many (failed) quests in the rest of the world. Or Loveland is memory proof : unless you're a Lvelander, once you leave the territory, you forget it ever existed, so nobody even looks for it. They have a type of magic that every other country need. Their leaders do not dare to attack Loveland and lose access to that magic while becoming the target of the others. Maybe only lovelanders have divination magic and people come from everywhere for prophecies, or they can change the weather and each year the leader that gives them the biggest bribe gets best weather for his country. Can be any other magic that is valuable, no need to be more powerful than the other's magics, simply unique to the people of Loveland. It can't be a technology since that can be stolen or copied, and it's a magic that requires a lot of people to be cast, so you can't simply kidnap and enslave one Lovelander mage for yourself. Not the answer you're looking for? Browse other questions tagged reality-check magic politics or ask your own question. How could a state without a military defense exist? How can pacifists creatures protect themselves without becoming the aggressor? How to make elections magic-proof? What would be the outer space equivalent of a country? Is there a way for a country to rebrand itself?